If you're in the market for the best dog gates indoor, whether for your pet's safety or simply to confine your dog so as not to allow him walk around the house, there are several aspects you'll need to consider to pick the right type of gates for dogs. Indoor dog gates are often referred to as pet safety gates, but are usually used for many different reasons. All dog gates provide a fenced-in area in your home that your dog can play around in without getting outside the designated perimeter. Dogs can be unpredictable, and this is especially true for puppies. Dog trainers warn that even the most well-trained dogs can sometimes cause serious trouble and injure themselves, especially when we do not have time to monitor them all the time. This is where using best dog gates indoor or outdoor can be very helpful. Furthermore, according to veterinarians, crating your dog or using pet gates is arguably the best way to prevent your dog from soiling the house as well. * Click on the best dog gate brand for more information, prices and details. Alternatively, scroll below to read our reviews and watch videos. While most dogs are unpredictable, puppies are especially so, which is why I often recommend picking the best dog gates as one of the essential supplies when new pet owners ask me what will they need. These pet gates are barriers that will prevent your pet from entering or exiting a specific area. They are designed to keep your pet away from anything that could cause him harm, too. Typically dog gates are made of either wood, metal or plastic. As I've explained in my video comparison review, there are a few things that you need to consider before deciding which gate is right for your dog. 1. Pick one that will contain your dog as he grows. Your puppy may be little now, but you want to buy a pet gate that will still work when he’s full grown. If you buy a gate designed for small dogs, your dog may be able to easily jump over when he’s grown. 2. Choose the appropriate size and strength. You need a gate that will withstand the pressure your pet is sure to put on it. A small breed will not likely be able to push over many dog gates, but a large breed dog would easily knock down even the largest free-standing gate. 3. Think about the purpose of the gate. Where will it be used? This will help to determine the best size and type of gate to purchase. Will you be traveling with it? If so, you’ll want a lightweight gate that is easy to store. Will it be used indoors, outdoors or both? This will help you decide what type of gate – wood, metal or plastic – you should purchase. Free-standing gates – they stand up all by themselves. You simply put them out as boundary line for you dog. These gates are best for well-trained dogs or older pets that won’t test the boundary, as they can be knocked over easily. Pressure mounted gates – these need to go in between two walls or in a doorway. They may be widened in very small increments. Each time they are widened the sides of the gate put a bit more pressure on the walls or on each side of the doorway. When the final adjustment is made, there is enough pressure on each side to hold the gate. Hardware mounted gates – these gates require hardware to be fastened to the walls or to both sides of a doorway. Using a latching system, they can be opened and closed at will. The drawback to these gates is that they permanent holes in your walls or doorway and they can’t be moved on a whim. Whether the pressure mounted, hardware mounted or free-standing gates are better, you can see in my video review and read more details about my testing. For the best dog gates indoor and outdoor brands, we tested these products for several very important factors, including: effectiveness, durability, ease of use, price and cost-effectiveness. Here are the ten best dog gates you can get today. What are the Best Dog Gates Indoor & Outdoor? These first option best dog gates indoor come in mahogany, white, or autumn wood. The pet safety gates fit openings of 3 to 5 feet and have a tension-mount design that ensures the gates won’t wobble if/when your dog tries to make a break for it. These indoor dog gates have an easy-open anti doggy door that is convenient for humans, yet secured from your Fido. It swings open both ways and weighs fifteen pounds of solid wood. The reason Richell One-Touch 150 Model Wide Expandable Pet Gate are listed as the first of best dog gates indoor is because of its design, which is tension mount and incredibly sturdy. Also, the different wood finishing options make it very versatile for dog owners to pick which goes best with their home decor. PROS: Pet parents who tried Richell One-Touch 150 Model Wide Expandable Pet Gate have given it rave reviews, from commenting on these best indoor dog gates' overall elegant appearance to complimenting the actual framework of the design. It’s a very sturdy gate, made of wood and steel, and it will withstand even bigger dogs who might attempt to run right through it. These best dog gates indoor are also very versatile in their lengths, working with doorways that are between three and five feet wide. One of the worst feelings is spending money on a pet product and then taking it home to realize that it doesn’t fit and you have to return it and start from square one. With this pet safety gate, it will fit a wide range of doorways depending on what you need. These best indoor dog gates are easy to install, according to majority of customers, and won’t take long to set up. All the tools are included. Though it is pricey, the pet gate is well worth the money spent. CONS: As aforementioned, these dog gates indoor are on the expensive side—but it also is worth the money. It’s a solid investment for someone who frequently leaves their dog(s) home alone, but doesn’t want to crate them. A second negative is that the thumb slide on the latch is confusing for younger kids who want to get in there. It’s dog proof and, apparently, childproof in some cases. The doggy door also doesn’t open at a full 180 degree angle. There’s a gap there that isn’t formed from a vertical angle, but it is still able to be maneuvered. All in all, it is a sturdy, solid pet safety gate that is an investment that will pay off regardless of whether you own a house or a bigger apartment. Made by Dynamic Accents, this Walk-Through 5-Panel Free Standing Gate is easily the second one of the best dog gates indoor for pet safety. It has a mahogany finish that the company claims is “pet friendly,” and it is 32 inches high (a little bit shorter than your average three year old). The hinges are double and the five panels form a “zig zag” on these indoor dog gates that expands or shortens to your desired overall length. It can fit doorways up to nine feet wide. The dog door is made of powder-coated steel and the tension-spring hinge prevents dogs from pushing the door open themselves. The overall gate material is poplar hardwood. We decided to list Walk-Through 5-Panel Free Standing Gate as the second best dog gates indoor right after the first because I found out that the zig zag panels opened up to a certain length, but were a little hard to get into for a human. Also, the finishing only had one option, so you didn’t have much versatility there. Still, it seems to be a fantastic pet safety gate according to many reviewers. PROS: Walk-Through 5-Panel Free Standing Gate are extremely sturdy, due to the powder-coated steel and hardwood construction. The entire fence is able to close off an area with a wide entrance-way, something that is useful if you’re planning to take your dog out somewhere that has a wide enclosure-opening. These second best dog gates indoor are very well-made and can be removed easily when you’re not using them because of the latch. The latch is simple to unlock, yet will be sturdy if your dog tries to ram it. CONS: If you have a dog that shows a surprising amount of ingenuity, these indoor dog gates could be problematic once your pooch figures out the latch. One customer with a beagle (a notoriously clever dog) said that her pet gate for dogs purchase started out well, but the beagle eventually caught on and was able to come and go as she pleased. If your dog is this smart, he or she might be able to put the pieces together and figure out how to work his way out of this dog playpen. A way to avoid that is to put in some dog toys and treats that your dog likes in the enclosed area. If he or she doesn’t have a reason to leave (boredom, curiosity, etc.) the safety of the gated area, they won’t have the incentive to trick their way out. The famous Richell 3-in-1 Convertible Elite Pet Gate is at the third place on our list of best dog gates indoor, and to no shame at all. This indoor pet safety gate has six panels and can cover a span of around fifteen feet. This best indoor dog gate is recommended for small dogs, as the pet gate can be folded into a small enclosure to put your dog in (like a pet playpen). It is almost 32 inches in height and can also function as just a freestanding gate for dogs. The panels are detachable, so you can adjust the size to fit your home’s needs. The panels of this indoor dog gate are locked at either 90 or 180 degrees, depending on what you need. The gate door is lockable, but easy enough for humans to figure out if they are going from room to room (you won’t have to move the whole pet safety gate to get where you want to go). It's a great option, but I chose to put Richell 3-in-1 Convertible Elite Pet Gate as the third one of the best dog gates indoor because the panels lock at right or straight angles, so that diminishes flexibility. But for homes with floor plans that were amenable to this, it was a great fit. PROS: One of the best features of Richell 3-in-1 Convertible Elite Pet Gate is that it is so simple to put together; you don’t need any tools. You just use the pins and lock caps on these best dog gates indoor to maneuver the pet gate to the position you want it in, a blessing for dog owners tired of putting together labyrinth-like pieces of dog equipment. It is versatile, as you can add on or take off pieces to adjust the indoor dog gate to your home’s needs. You can also take apart the pet gate panels and use smaller sections for different areas in the house. The linking mechanism is easy enough to allow for this diversity in setup configurations. It’s built well and the wood is attractive enough that this won’t be an eyesore. CONS: This doggy gate is very expensive, but customers have roundly agreed that that expensiveness is well worth it. Also, the pieces may be kind of heavy for you to move around according to several dog gate reviews from other customers (the gate weighs 50 pounds with a shipping weight of 58 pounds), although the linking mechanism is easy to use. These indoor dog gates are recommended for smaller dogs, so if your dog is a good climber, that could be problematic for you if he or she gets a running start and is able to scale the 31” jump. Just as their Richell competitor, Cardinal Gates Perfect Fit Pet Gate are just as great of an option as one of the best dog gates indoor. It has six panels and can either fold into a hexagon-shape enclosure or it can be used in its full length, which is 12 feet in length. It works as a playpen for dogs, gate, or any form you can make with the panels. There is a puppy door built-in. It folds like an accordion for storage and is made of painted wood and black steel. The doggy door is spring-loaded and the gate-door latch is located on an existing panel. My choice to place Cardinal Gates Perfect Fit Pet Gate as the fourth best indoor dog gates is due to it is very versatile in its potential uses, yet the hexagon length is slightly small for larger dogs and it can really only fit a certain size dog (small or medium at most). PROS: The configuration of Cardinal Gates Perfect Fit Pet Gate as the fourth best dog gates indoor is a big reason it is so well rated by many customers online. Because the panels of these pet safety gates are easy to interchange and unlock, you can make whichever shape you need with these six panels that are available for you to play around with. The puppy door is also useful for dog owners who have young dogs that the need to reach in and out of the indoor dog gate enclosure for. Puppies are wild and this dog gate is sturdy enough to hold them back and keep them in one place. The materials the pet gate is made of are attractive enough that they’ll fit well with most home décor schemes. The well-constructed design and versatility of these fourth best dog gates indoor make it worth the money. CONS: Seeing as the height is a little over two feet, if you have a taller dog, he or she might be able to jump or climb over this pet safety gate. Also, the doggy gate itself is heavy and can be awkward to move around even when in a folded position. But overall, the sturdiness of the gate is what is contributing to the heaviness, so that can be considered when lifting it. Another Richell product, the Richell-Extra Wide Tension Mount Pet Gate, this one is slightly less popular with customers looking for the best dog gates indoor. It has been widened to extend across further distances, and the pet gate can fit doorways three to five feet wide. It is recommended for dogs between eight and forty-four pounds and is 34.6 inches high. This dog safety gate is made of hardwood and has rubber stoppers that will prevent it from scratching up your floors and walls. The design, as indicated in the title, is tension-mount and impervious to slipping or being easily jostled. The pet safety gate lock can be done and undone with one hand and there is a 90 day warranty. I decided to place Richell-Extra Wide Tension Mount Pet Gate as the fifth best dog gates indoor, and that's because it is a well-designed gate, however, the size scope is limited. Pet owners with larger dogs wouldn’t be able to really use this pet gate, though it’s great for small sized dogs. PROS: As with the other Richell products, the sturdiness of Richell-Extra Wide Tension Mount Pet Gate is a big plus. The hardwood is very beautiful (read: not an eyesore) and the stoppers prevent your walls and floors from being scratched, which is a huge bonus for pet owners tired of buffing out scratches and scrapes. Another positive aspect of these fifth best dog gates indoor is their ease of use. The lock on the pet safety gate is very simple to maneuver, but that ease doesn’t interfere with the security of the gate. The tension mount will help keep your dogs from making a break for it. Customers overall were most satisfied with the appearance and the strength of this doggy gate—they felt secure leaving their canine home alone with the Richell gate up. CONS: This indoor pet gate is only suited for dogs less than 44 pounds, so if you have a bigger dog, this probably isn’t the gate for you (same if you’re an owner with a dog that can easily scale heights of three feet). Also, it’s important to clarify the sizing, as some customers found that the size descriptions needed more precision. The sizes of these fifth best indoor dog gates hallway are three feet, four feet, OR six feet. If you have a doorway that is outside one of these specific ranges, the gate will not fit and, as one customer put it, you may have to use some “redneck engineering” to re-size the pet gate. As indicated in the title, Primetime Petz 360 Degree Z pet gate makes a “Z” formation when it is set up for your dog. Even though it's the sixth on our list of best dog gates indoor, this is still a great option to consider. This pet safety gate is collapsible and expandable (sort of like an accordion). The wood has a Walnut finish to it. There is a walk-through door on the doggy gate and it can span areas of up to 72 inches wide (six feet). The pet gate is thirty inches high (two and a half feet) and the gate is appropriate for pets of all weights. Now I chose to put Primetime Petz 360 Degree Z as my choice for the sixth position of best dog gates indoor because the Z formation is convenient for floor plans of all different types, but the height of the gate is somewhat low, meaning that dogs that are tall could probably escape. PROS: Pet parents who purchased Primetime Petz 360 Degree Z were especially enthused by this gate’s construction because of the beautiful wood finish and the fact that that wood was chew-resistant. It also is easy to construct, as it basically folds out to the desired length like an accordion and can be collapsed for easy storage. The pet door located in the gate is for our—the humans’—use. No more hopping the gate and almost tripping and breaking our necks with these best dog gates indoor. With the doggy door in place, you can conveniently leave and enter when you want and re-lock the opening on your way in or out so your pooch can’t get back through. 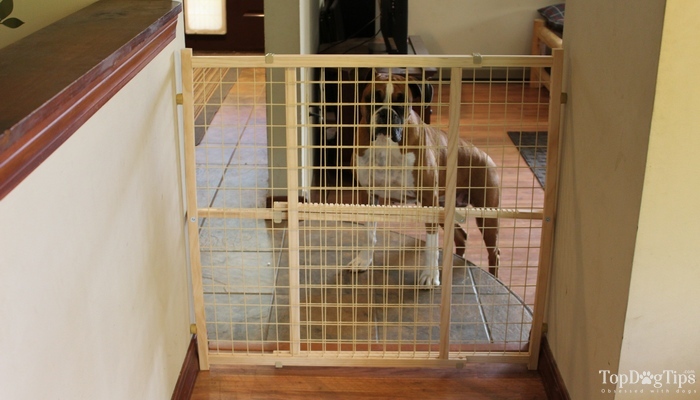 Customers with complex home floor plans in their houses were most fond of this pet safety gate’s Z-formation design, as that worked with their home’s interior the best (as opposed to a gate at solely 90 or 180 degree angles. CONS: The height of this gate is only two and a half feet tall, so if your dog is big enough to jump it, this might not be the best indoor dog gate that you should choose. And, as some customers noted, if your dog is big enough to ram the pet gate, he or she could send it sprawling, as it is not designed with clips to secure it to the wall (though you could purchase some and add them into the gate design). Keep in mind the size and height of your Fido when looking around for best dog gates indoor anywhere. If you think that he or she will be hard on the dog safety gate and repeatedly attempt to knock it over and ram it, this might not be for you. One more great product from the famous Richell manufacturer. This Richell Mission Aztec Freestanding Pet Gate is our seventh one of the best dog gates indoor, and it's mostly recommended for dog owners with pets between 6.6 and 33 pounds. It has rubber feet to keep it in place and its dimensions are 23.6 inches by 42.1 inches by 20.5 inches. The width of this pet safety gate is adjustable to fit different-sized hallways and openings. It is free-standing and doesn’t need to be attached to the wall; it can be set up wherever’s necessary. I'm placing Richell Mission Aztec Freestanding Pet Gate as the seventh one of the best dog gates indoor because although the design is very beautiful, the size limit is constrictive. Owners with larger dogs wouldn’t be able to use these pet safety gates. PROS: Customers of Richell Mission Aztec Freestanding Pet Gate were especially enthusiastic about how beautiful this gate is—and they’re right. It’s made of Autumn-Matte hardwood and has stained glance windows in an Aztec pattern. It’s definitely made with style (and function) in mind, and is probably one of the most good looking pet safety gates on this whole list of best dog gates indoor we have going here. The pet gate also expands from 42.1 inches to 72, providing a decent width that it can accommodate. The doggy gate is sturdy enough to stay freestanding and the rubber feet keep it locked in place. It’s very heavy (the shipping weight is 31.4 pounds) and it has two side panels that help keep it upright. Although it doesn’t attach to the wall, it still is very solid in its position. It’s also not always easy to store, as the pet safety gate collapses to a width that is still over three feet long. So if you’re someone who doesn’t have a lot of closet space (small apartments), be aware that storage with these indoor dog gates requires at least three and a half feet of space. I quickly found out – as I'm sure you have too by now – that Richell owns a big chunk of the market on the best dog gates indoor or outdoor. It comes as no surprise that we have another one from them, and it's the Richell Freestanding Pet Gate that comes in an autumn matte finish (it is constructed of wood) and its dimensions are 23.6 x 39.4 x 27.6 inches. It can extend from 39.4 inches to 70.9 inches. This indoor pet safety gate is recommended for dogs from 6.5 to 33 pounds, so small-sized. Its side panels fold in and there is a 1 ¼ inch space between the slats in the gate. It also has rubber feet to prevent the gate from sliding. With so many other Richell products listed above, I don't feel bad about listing Richell Freestanding Pet Gate as the eight one of the best dog gates indoor on the list. Why? Because this doggy gate is beautiful, but like the one before it, the size limit makes it very restricted to smaller dogs only. PROS: Richell Freestanding Pet Gate is easy to hold up, and many customers commented that the rubber feet and the side panels kept it very sturdy. It’s also easy on the eyes and convenient to store because its side panels collapse down. Owners who tried these eight best dog gates indoor and who have small dogs commented that this pet safety gate had wire slats that made it very sturdy, preventing the dogs from slipping through the slats (as one owner with a Chihuahua puppy said had been a problem) or budging it over. CONS: Again, this gate has a size limit and if your dog can scale heights of two feet, he or she may be able to get over it and run through the house. Also, though this is collapsible, the width of the collapsed pet gate makes it a little over three feet in length, so be sure you have that storage space available. Made of hardwood, the side panels of Hard Wooden Freestanding Pet Dog Gate rotate nearly 360 degrees and the center panel is a fixed 180 degree angle. These ninth best dog gates indoor are made of wooden slats and the dimensions are 40 inches (but that stretches out to 70 when expanded) and have a height of 20 inches. There are integrated handles on the center panel of these pet safety gates for easy transport. In my opinion, Hard Wooden Freestanding Pet Dog Gate deserves to be placed at the ninth position on the best dog gates indoor list because the center panel is fixed, so there isn’t much flexibility. Also, the height of these pet safety gates is very low. But for small dogs, this will work great to block off stairs, of course. CONS: This pet safety gate is really low. At 20 inches, it is able to be easily jumped over by smaller dogs. If you want to prevent that, you’ll need to either train your dog not to jump over it (good luck with that!) or only use it for non-jumpers who won’t try to hop over. Alternatively, look into getting some other best indoor dog gates from above or search for anything taller. Last but not least on our list of best dog gates indoor, Brookstone Free Standing Pet Gate is a decent option. It is 20 inches tall and has a width of 39 ¼ inches that expands to 72 at its full width. It is made of a dark hardwood and the end panels are 18 inches. The pet gate comes assembled and doesn’t require any tools to use or install. The width is adjustable, which is always a great option to have on your pet safety gates for home. Finally, I chose to put Brookstone Free Standing Pet Gate as my last pick on this list of best dog gates indoor because the wide length, though versatile, is still not high enough to be able to successfully keep out larger and even medium sized dogs. PROS: This pet gate for dogs has a versatile width length that allows it to function in different spaces in your home, according to multiple online reviews from customers who purchased Brookstone Free Standing Pet Gate. It’s also easy to move, and dog owners especially were delighted at the fact that it was made of such a pretty wood. The design is free-standing, so there is no installation that needs to be done and thus no damage to walls will be done if you treat this safety gate for pets carefully. CONS: One more time yet again – this pet gate is for small dogs alone. The height is 20 inches, meaning that if you have a jumper for a dog or any other pet that’s able to get over that height of your indoor pet gate, this might be a problem for you. Also, one customer remarked that it is “not easy” to store in a smaller closet because it isn’t as collapsible, which can become a huge problem. Why else should you consider buying dog gates indoor? Best dog gates indoor are a valuable tool for pet owners for several reasons. First, sometimes you don’t want to keep your dog in the kennel the whole time if you’re looking to try to keep him or her in somewhere. Let’s say there’s a family get-together and your dog tends to want to run wild at those, as was the case with my Australian Shepherd, Walter, who terrorized our household’s Thanksgiving party one year by catapulting himself directly onto the table and ruining the meticulously carved turkey. You might not want to lock him or her away from family time into a small, confined space, but you still don’t want your Fido running amuck. By purchasing either one of these best dog gates indoor, you can fence off an area that your dog can play in that isn’t as small as a dog crate, but won’t let them interfere with the rest of the household. Dog gates indoor or outdoors are also an important pet safety measure. 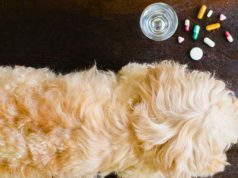 Most homes have a lot of sharp objects and other dangerous things (toxic cleaning chemicals, electrical outlets/cords, knives, vases that can fall off tables and give your dog a concussion) that a dog can find him or herself entangled with. If you want to leave your dog at home while you’re gone, a dog gate indoor is the best way to prevent your pet from roaming the house and possibly hurting him or herself on one of the dangerous household items. Dogs want to feel like they’re a part of the family, but we don’t always want them right by us (for both of our sake). By purchasing one of these best indoor dog gates, you’ll be able to curtail your dog’s accommodations while also still being able to play with him or her—you can fit inside an indoor dog gate area, but you can’t fit inside a dog kennel. The list of best dog gates indoor below will tell you the top ten options of superb indoor dog gates as rated by customers who bought them. Most of these dog gates indoor are made of high-quality materials and provide the most secure, locked confines for your dog to ensure pet safety measures are up to par. 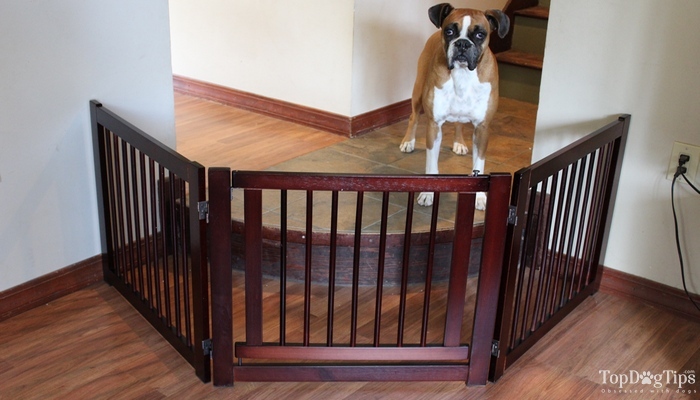 By prioritizing your dog's safety first, these indoor dog gates combine comfort with security. The pet gates are each different in size and shape, some being more appropriate for small dogs and others dog gates for large dogs, but they all provide safety. In each of the product overviews below, I'll give you a quick rundown of the best dog gates indoor options and then tell you the pros and cons of the product as per customers' notes. How should I choose the best dog gates indoor? So now that I've presented you with a list of top ten best dog gates indoor that I have gathered from hours of research and reading, how do you pick the pet safety gate that's right for your and your canine? Let me try to give you some tips on that, but do look around elsewhere for more precise advice. First, consider your dog’s height and weight. You want a safety gate for pets that will be able to keep your dog safely confined without risking them jumping over it and/or breaking it. You want to make sure that you check the height and width of the best dog gates indoor that you buy (which I tried and listed for you in the descriptions of each product option) to ensure that they are appropriate for your pet’s size. Second, think about your home, your floor plans, your decor and everything else that will come in contact with your doggy gates. Everyone’s floor plans and width needs are different, so a pet gate’s collapsibility, width, and length are important factors in what you choose. Check whether your future buy of pet safety gates are collapsible for storage and the other measurements for your doorways or considered areas. By checking through the characteristics of your dog and your home, you’ll select the pet gate for dogs that best fits the both of you. Happy shopping!